Some people might disagree, but you need a swimmable beach anytime you stay in Cabo San Lucas. The ocean air and weather makes it too inviting not to swim. And some hotels are either landlocked or located on the west side of the point, where swimming is impossible because of the waves and riptides. 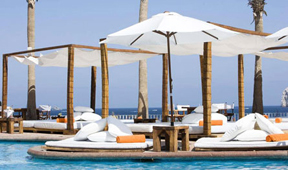 ME Cabo is idyllic for this reason, even if you don't spend every waking minute on the beach. You'll want to. The music starts every day around noon and the place becomes a party within a couple of hours. The same goes for the terraced pool area on the weekends, especially Saturday night. During the week, everything is considerably quieter (compared to the weekends). You're much more apt to notice the wear and tear in the town and the club music can still be a bit much. And yet, it's Cabo San Lucas. 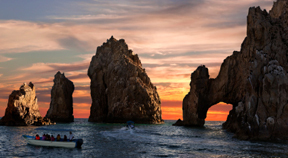 The ME Cabo is the heart of the Cabo San Lucas. There are a few things you need to know before you stay here. Booking a view room is an absolute must, as is asking for a room farther away from the lobby and club. If you can afford it, upgrade for one of the rooms on the upper floor (about $50). They call that the "Level." Booking a better room is especially important if you are looking for something more relaxed. The experience varies dramatically. The same can be said for the entire city. So other hotels might be a better match for escaping couples or families (like the nearby Casa Dorado). This is a party hotel. I went with two friends and we were looking for fun. They picked the ME Cabo because they had stayed there before. It's one of the best places to mix and mingle with people in their twenties to forties. On the Level floor, you'll know your experience is different. The rooms have private balconies overlooking the Sea of Cortez. The beds are comfortable, with 300 thread-count sheets. The extra bed is not as comfortable (about $80 per night), but the couch works well enough. So do the patio chairs, where I fell asleep on the first night. The hotel itself feels like a destination, which is by design. It's owned by Sol Melia, which owns experience-based hotels all over the world. Its newest is opening in London this spring. It would be easy enough to stay at ME the entire time, but there are other places to go. But it also feels good to have a home base, knowing you can always eat at The Deck. It's easier to get a table there than it is to lock in a cabana bed or lounge chairs during peak times. Everything is within an easy walk of the ME Cabo San Lucas. You might need a car or a cab for some excursions, but staying at a central hotel has advantages. You can walk almost anywhere, including to the water taxis continuously departing for the El Arco. While it is the most common thing to see in Cabo, there is always a thrill being bounced around in a water taxi where the Pacific meets the Sea of Cortez. Make sure you take one that allows you to hop out at Playa del Amor (Lover's Beach) and spend a few hours. (The water taxis will take you back any time.) If you get off, prepare to get wet. The taxis don't land at the beach; you have to jump into waist deep water, off a rocking boat when the water is choppy. The less common excursions (meaning less crowded) are fishing tours and parasailing expeditions, which highlighted my trip. Definitely charter your own boat, usually for five to six hours. The guides will take you anywhere you want to go, but they mostly want you to catch a fish, especially a marlin. We did, but it wasn't me. Anything in March or earlier will usually be cabrilla, yellow tail, or wahoo. But our guides were good, especially because we asked questions and befriended them. The best part of about chartering a boat (assuming it's a small boat) is you can find one for about $300 to $500, which includes license, bait, equipment, cervezas, and cleaning your catch (unless you release it). The only extra is the tip (usually 15-20 percent, which is why they want you to catch a big fish). The downside is heading out so early to get more out of the day. Seven comes up early. Some other stops to make in Cabo include Habanero's for breakfast, Tequila for dinner, and Cabo Wabo after that. But most of best finds along the tip of Baja California are made walking around. The downtown area and the marina are filled with little local shops and more commercial places too. ME Hotel At Cabo San Lucas Catches A Wave At 6.8 On The Liquid Hip Richter Scale. Truly, Cabo San Lucas is not Jack Kerouac's Mexico. This is a resort town as Americans would like all of Mexico to be. Since the 1950s, it evolved from a billfishing hot spot to a resort town. There are areas you can find with a little more authentic charm, but mostly you have to drive a few hours to feel it. 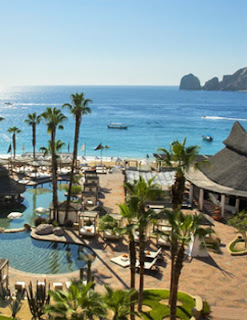 To make plans for Cabo San Lucas, compare deals for airfares, discounted hotels, and car rentals on Fare Buzz. Fare Buzz recently started a new promotion for servicemen and women to receive an addition $10 off too (code MIL10).